StingRay Tech Services offers upgrades for StingRay Parts Washer or retrofits, rebuilds and upgrades for MART Power Washers. Available Upgrades and Retrofits: for more details click on your washer below. REBUILD SERVICE: StingRay Tech Services can rebuild your MART, StingRay or other manufacturer's Washer at much lower cost than a new washer. These retrofits / upgrades are completed by our service technicians at your facility or fully remanufactured at the StingRay Factory. 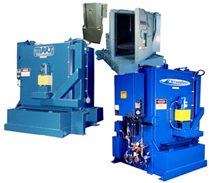 PREVIOUSLY OWNED USED PARTS WASHER: When you buy a used parts washer from the original owner, StingRay Tech Services can help you get peak performance from the equipment. We offer installation guidance, start-up commissioning, onsite inspection and operator/maintenance training. Our service technician helps you develop a list of needed improvements or changes and guides you through the repair and replacement of any parts on the washing machine. StingRay Tech Services offers free telephone assistance for set-up, troubleshooting and advice on the best improvements available. We can supply new repair parts and in many cases recommend and supply upgraded parts that are improvements over the original parts on your washer. Our service data files contain information about the original specifications of your MART or StingRay Washer, including electrical schematics, Service By Others (SBO) for utilities connections and parts lists. Our data files also contain information about modifications made to your parts washer. All of our telephone support services are free. This user support website contains a tremendous amount of technical data to help you get started.